With childhood obesity still making headlines and launching campaigns through the government and even through popular TV shows like The Biggest Loser, it’s easy to get wrapped up in the doomed nature that seems to loom over the childhood culture of our nation. But then there’s sometimes a bright spot to remind us that not all is lost. Like the kids on Biggest Loser who all lost between 40-50 pounds each while at home and still being kids. Like different programs popping up all over the country trying to get kids moving. And then there’s this girl. Seriously, I’m such a fan. If I was 10 years old, we’d be best friends for sure. Meet Amber. This girl has her own WEBSITE and COOKING SHOW that she makes on her own (well, with the help of her mom). 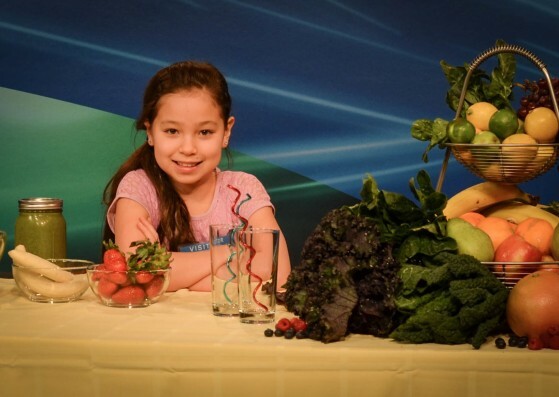 But she’s such a big deal, she comes on the local news occasionally to show kids how they can have healthy lunches that they make themselves. How cool is she? I originally found her because the makers of my favorite bento lunch box, Laptop Lunches, posted about her on their Facebook page because Amber was featuring the trusty box with her little recipes. It really is the best lunch box ever, by the way (for adults and kids). More to come on that in the future, though. But if you think this kid is adorable, you have to check out her Website. I was beyond impressed. What a great way to make a difference for your own generation at such a young age? Way to go, Amber! And for all of you out there who think you can’t cook, or you can’t eat healthy because you can’t cook— um…no more excuses. If a 10 year old can do it, I’m sure you could learn. Cooking is easy and fun. You just have to give it a chance and be confident. But to get you started, check out my super easy recipes, like my spinach quesadilla. It doesn’t get easier than that!